a-n / AIR's Paying Artists campaign video is now live - watch, like and share widely to support the campaign! Why Pay Artists? from a-n AIR on Vimeo. You can also view and comment on the video on Youtube here. 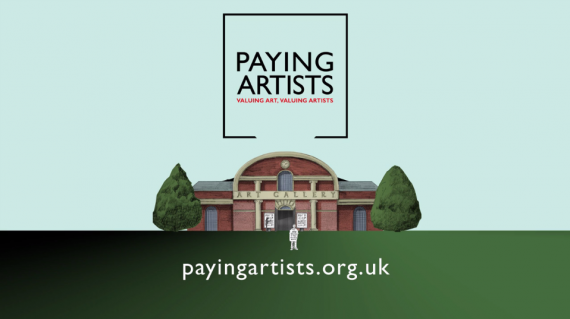 The Paying Artists campaign aims to secure payment for artists who exhibit in publicly-funded galleries. We believe paying artists for the work they do will mean that, in years to come, we’ll still be able to access quality art which reflects the broadest possible spectrum of human experience. Whether you’re a gallery visitor, artist, art student, policy maker or run a gallery, please download our report ‘Paying Artists – Securing a future for visual arts in the UK’ and sign up to the campaign. The Paying Artists campaign has been generated by a-n/AIR. a-n’s mission is to stimulate and support contemporary visual arts practice and affirm the value of artists in society. A well-established national visual arts network and lead body for visual artists, a-n publishes The Code of Practice for the Visual arts, visual arts contracts, fees and payment guidance and conducts on-going research into artists’ practices and livelihoods. Through AIR: Artists Interaction and Representation and the AIR Council, the professional needs and artistic aspirations of 18,300+ visual artists members are represented and impact on consultations and debate on developments in arts and cultural policy, arts education and social change.